Ah, the classic pizza margherita. A never-fail combination of flavors, and this one is made with a completely grain-free pizza crust. Eat your heart out! Line a baking sheet with parchment paper or a Silpat. Tear an additional sheet of parchment paper, and set aside. Combine the shredded mozzarella and cream cheese in a medium sized microwave-safe bowl. Microwave on high for 1 minute, stir to combine, and then microwave for another 30 seconds. Working quickly, add the egg, nut flour, and seasoning to the cheese mixture, and stir to thoroughly combine. The dough will should begin to form a sticky ball. Place the dough on the prepared baking sheet and cover with the additional parchment. Roll or pat dough to about ? inch even thickness. Gently remove the top parchment, and use a fork to poke holes through the crust. Bake for 12-14 minutes, or until crust has become golden brown, remove from oven. Use a fork to pop any large bubbles in the dough, then coat with a thin layer of the pizza sauce. Sprinkle with salt and pepper, and then top with a layer of mozzarella. Return to the oven until the cheese is melted and bubbling. 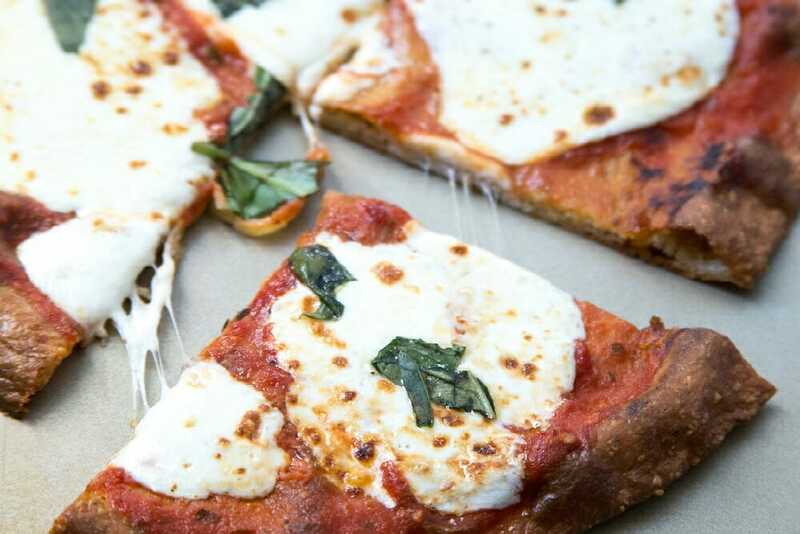 Tear the basil and scatter it over the pizza.